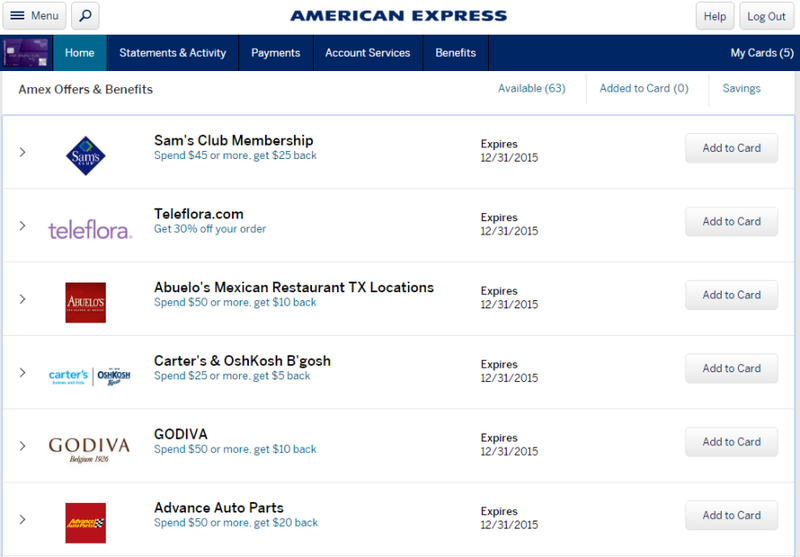 In addition to sign-up and spending bonuses, another great feature of American Express cards is Amex Offers, which is a great source of deals. This weekend, Citi launched its own take on this program: Citi Smart Savings. TPG Contributor JT Genter explores what’s been released so far. If you have an American Express card, hopefully you’re very familiar with Amex Offers. We’ve posted about some of the best deals, but there are typically dozens, and they vary from one Amex card to the next. As the program drives spending on Amex credit cards that might be spent elsewhere, it’s not surprising that other banks might want to emulate this successful program. Well, this weekend — without any fanfare — Citi released its own program: Citi Smart Savings. 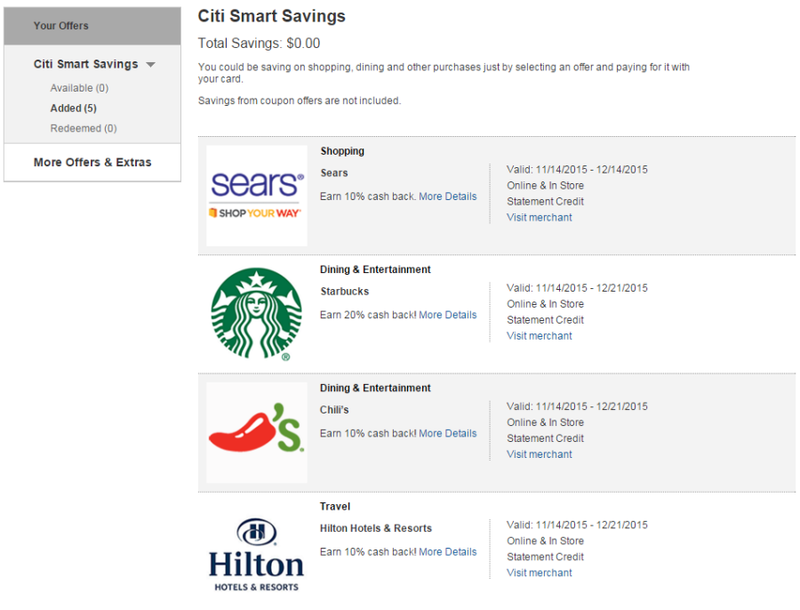 The initial Citi Smart Savings offers for my Citi Premier card. Hilton: 10% cash back (up to $50) through December 21 when you spend at least $200. Sears: 10% cash back (up to $35) through December 14. Sports Authority: 10% cash back (up to $20) through December 21. Chili’s: 10% cash back (up to $12.50) through December 21. Starbucks: 20% cash back (up to $4) through December 21. However, my personal Citi / AAdvantage Platinum Select World Elite Mastercard and my CitiBusiness / AAdvantage Platinum Select World Mastercard didn’t have any Smart Savings offers. Other cardholders have reported these same five offers for the Citi Prestige and Citi Hilton HHonors Visa Signature Card. As there hasn’t been a formal announcement from Citi about the Smart Savings program, it remains to be seen if all Citi cards will receive offers or if it will be limited to certain cards. Citi Smart Savings offers in the Citi Mobile app. I tried to add all five offers to my account on the website but received error messages each time. Other TPG team members had the same problem adding offers online. However, I logged in to the Citi Mobile app and was able to add the offers to my account with no problem. One other perk of the app: It uses your GPS location to note the distance to the closest store — even if that store is humorously far away. Right now, the closest Sports Authority is 129 miles away from me! My Starbucks gift card reload showed up almost immediately as Pending. 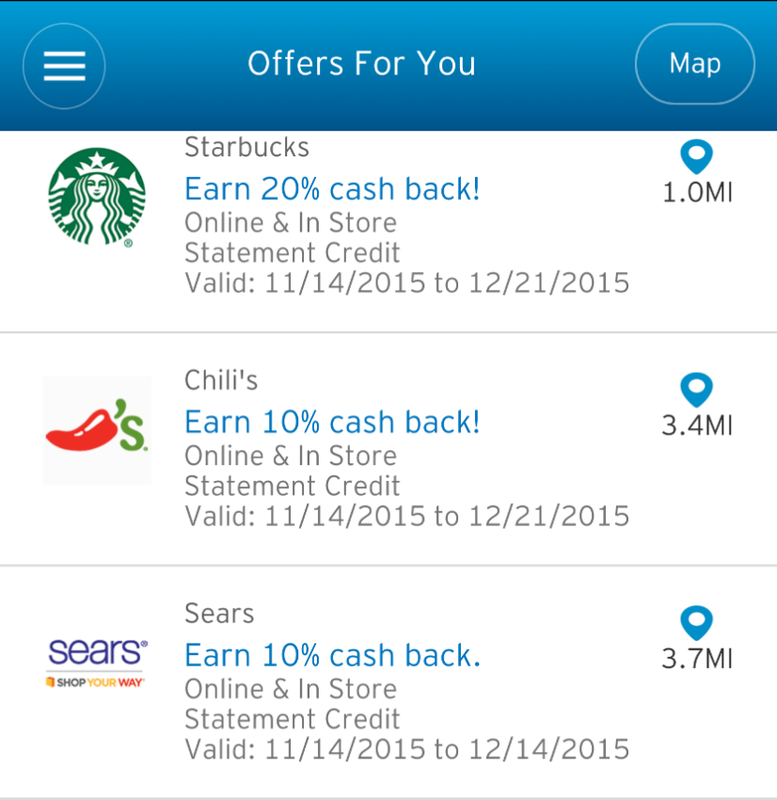 I tested Citi Smart Savings by reloading my Starbucks gift card with $20. At 20% back, this would provide me with the maximum $4 statement credit. After completing my purchase, I logged in to Citi to see if it would show up. Although the credit card charge was pending, the Citi Smart Savings offer didn’t show as redeemed at first. When I checked back about an hour later, the offer was showing as pending. My Amex Starwood Preferred Guest card currently has 63 available offers. Hopefully, Citi Smart Savings will have as many offers once it gets going! Unsurprisingly, since it’s a new program, Smart Savings’ selection of deals pales in comparison to what’s available through Amex Offers. For example, I see more than 60 offers for my Starwood Preferred Guest® Credit Card from American Express. An interesting distinction between the two programs is that Citi’s Smart Savings gives you a percentage of cash back, rather than giving you a set amount of statement credit (or Membership Rewards) for spending a certain amount. While some Amex Offers provide a nice return — like a $50 statement credit for spending $250 or more at Sheraton hotels — you might not want to hit the high spending threshold (i.e., $250) to get the bonus. Getting a percentage back instead means that you can spend the amount that you want to spend, and not a penny more. While there aren’t many offers initially and they aren’t available on all Citi credit cards, we’re excited to see what Citi Smart Savings has to offer once it gets going. Hopefully, Citi can build this program into one as large and successful as Amex Offers. What offers do you see when you log in to your Citi account?